This will seem really odd, but this old, green metal box is very representative of my childhood surroundings and the industrial manufacturing my parents were apart of their entire careers. 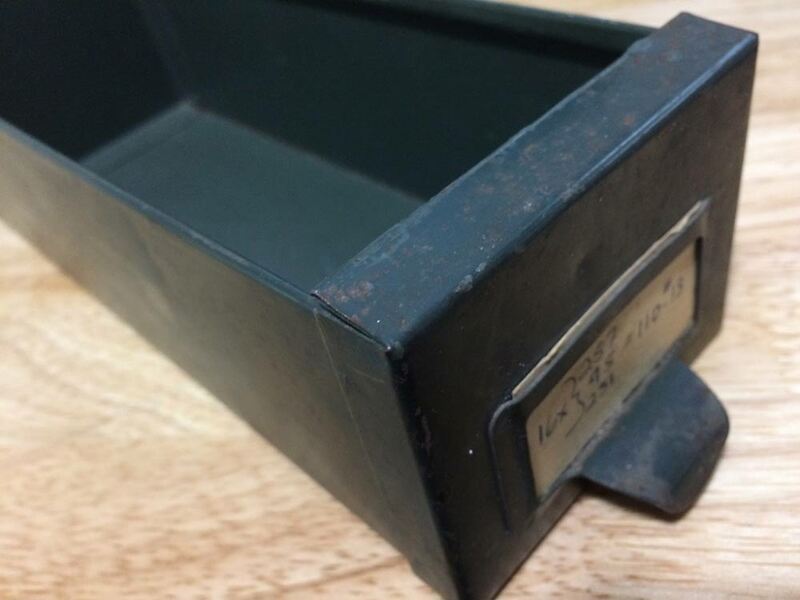 It’s actually a metal filing drawer, long removed from a larger, steel cabinet that held siblings. Signs of wear, age and rust give it the ‘patina’ antique collectors desire on other objects. A paper label yellow with age displays cryptic numbers. Clearly important once for inventory and organization. Now forgotten to time. What stories do those dents have to tell? So why is this special? I feel like there was something like this in every place my parents worked or owned during my childhood. Obviously it served a quiet utility purpose for decades, silently storing sewing and manufacturing objects until a craftsman had need for it. There were lots of iron and steel objects in the businesses. Sewing machines, specialty machines, presses, work tables, desks, stools, chairs, shelving, etc. most everything was that matte finish dark green. Everything felt solid and heavy — serious substantial objects that make noise when dragged across the floor, unlike the plastic equivalents of today. For two decades this simple drawer collected dust in my basement holding an assortment of shelving nuts and bolts until it caught my eye and I rescued it from that mundane duty. What shall I use it for now? Paper clips on my desk or printer station? (LOL) I hope I can honor it more creatively than that. What object do you hang onto as a memento to honor your past? Reading your post, I remember my childhood time. My family had a very nice wooden box. It was a hand-made one in black and red color. I like it very much. My father told me that It was from my grandson. I still keep it now in my house, clean it, and put it in a very grave place.